You have no experience on flying Paramotors, or any other flying discipline. You had never even thought of flying or being a pilot before. 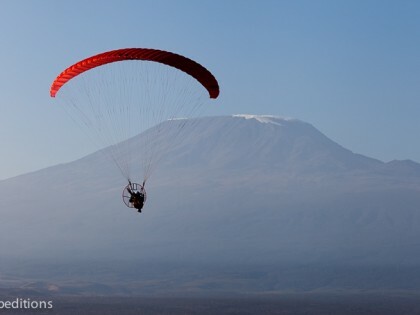 You want to see Africa with us from the sky, piloting your own Paramotor. THIS TRAINING EXPEDITION IS FOR YOU! Our Training Expedition takes place in the Heart of Africa, in one of the most scenic parts of Namibia. You will start with a 6 days intensive training course amongst the giant red sand dunes of the famous Namib Desert, after which, you will immediately put your newly-learned skills into practice, participating in a real 6 days expedition in the wilds of Africa, looking for wildlife and flying above amazing landscapes. 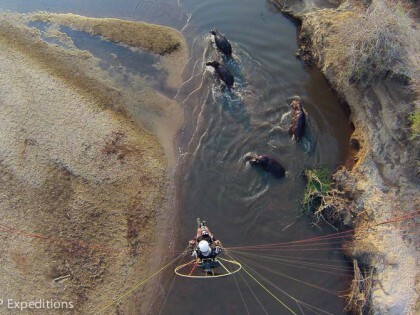 Having completed your extraordinary African experience, you will be a qualified Bush Pilot, ready to join us on other expeditions, or to fly on your own wherever you like! 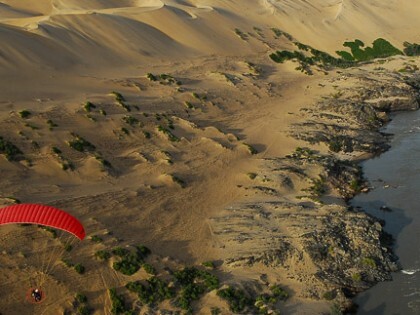 Our 14 day training & flying expedition starts in the Namib Desert, where you will learn to fly with a Paramotor over the highest dunes, fllowed by an expedition further north to discover the wonders of the Damaraland. Get your very special personal Bush Pilot Training during 6 days surrounded by the scenery of the Giant Dunes of the Namib Desert in Namibia. Improve your new piloting skills immediately and go flying in the bush. 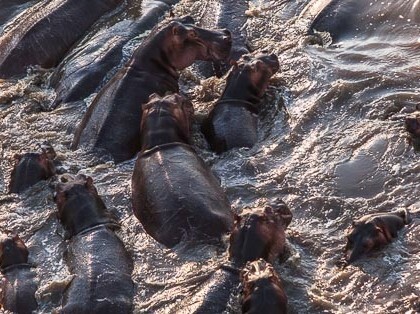 Live a real expedition in Africa where you will meet few other human beings. 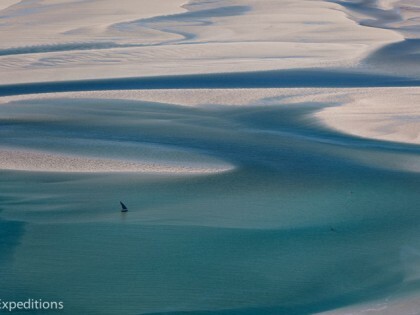 Follow the beautiful giraffes and the large herds of Oryx across the sands. 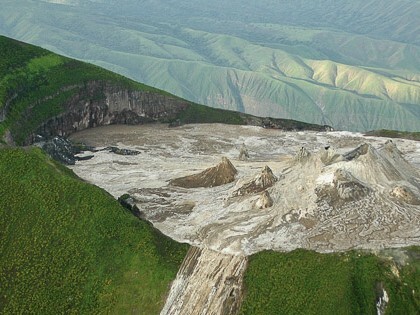 Explore the intriguing untouched dry rivers of the region. Camp in the middle of nowhere – with only wild animals for your neighbours. Fly over the last really free Elephants, you will have earned it! Arrival at Windhoek Intl Airport; transfer by road to Swakopmund, on the Namibian coast. We will stay at the Protea hotel on the beach, where we will have our comfortable base for the training. Day 1: Presentation of the equipment, formatting profile and sail control on the ground, familiarisation with the engine. Day 2; Simulation of take off. Tandem flight with exercise turns, and grassroots approach. First solo flight with radio. Day 3: Single Flights, working on takeoff and landing. Day 4: Exercises in flight. Day 5: Exercises in flight, advanced techniques necessaries for safe bush flying. Day 6: Summary of exercises in flight and TO’s/Landings in order to reach self-sufficiency. Daily theoretical sessions tailored to complement this training progression. We leave at 10 am. and start to move north. We should reach the Brandberg the Highest Namibia mountain, in the afternoon. We will stay there for the night, nobody around and wildlife starts to be present. 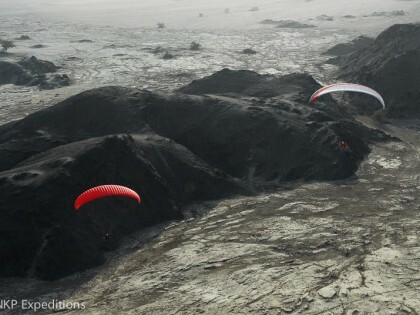 We will start in an easy place, 500 m above sea level, with different flying conditions. After preparing our gears we will start exercising and eventually fly in the afternoon. First night camping in the bush and serious briefing around the fire. We will do our first flight in the Damaraland, flying over the beautiful Brandberg and we will leave 11 am heading north, after breakfast – 100Km. We leave the gravel road for hard off road, crossing the Ugab Valley, there are chances to see elephants and rhinos. We will stop in an incredible place with desert rocky formations, at a sharp peak were is a nice flat area with an ideal slope to practice and eventually we will take off for an afternoon flight. Camp will be set up in the wild in this beautiful spot. We will do a fabulous flight in the Ugab area and leave after breakfast around 11am heading north west to the Springbok river valley. 100km of tough off road. We will reach the first serious river bed where we will camp. 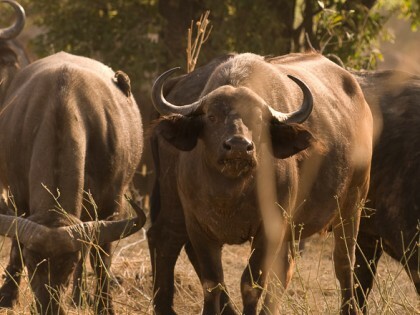 I often see lions and black rhinos here, perhaps we will be lucky. The site is easy to take off but a bit more difficult tan the first ones. We will plan to fly 2 hours following the river and looking for the wildlife. The scenery is incredible beautiful. Eventually we will try to fly in the evening and prepare all the gears. Camp will be set in the bush here. Crossing the beautiful landscapes that makes a natural border with the remote Damaraland, few vehicles are encountered around. We will reach Palmwag concession or Grootberg in the afternoon. The evening will be free to relax and enjoy the lodge where very often, large elephants are guests as well. We will eventually visit the team of Save the Rhino trust, who manage a conservation project taking care of an endangered population of black rhinos. And see if they let us fly to seek for theses beautiful creatures. After packing all the equipment in the vehicles, we will take the off-road route heading to the Huab valley, there is a lot of wildlife roaming around and if we are lucky we can find the endangered Black rhinos. We will stop to set up the camp and start preparing the paramotors. If the wind drops we will eventually fly before sunset. We will take off at 6 am for the morning flight, sometimes there is a light mist and this is a fantastic opportunity for flying overcast for the first time. We will leave the camp after breakfast, after the staff have packed all the equipment, and will carry on off road to the Hoanib valley. This valley is home of the elusive Desert Elephants and other numerous species (giraffes, oryx…), the sceneries are fantastic, absolute remoteness. Evening flight if possible, while the staff is setting up the camp. Here we can often hear lions roaring in the night. And often there are flash floods in the river beds that take everything away, including intrepid campers – so we do not pick the place to set up the camp anywhere! One of the best spots of the trip, a real achievement, is the amazing Hoanib Valley. Here the chances to find desert elephants are high. Flying here will be unbelievable, but after breakfast its time to go back to Windhoek and civilisation. A full day of gravel road to reach the capital. We will stop at the Arebush Lodge, a comfortable place where we will be able to pack the parameters, and have the last dinner together. (Optional: charter flight to Windhoek to take your international flight the same day). 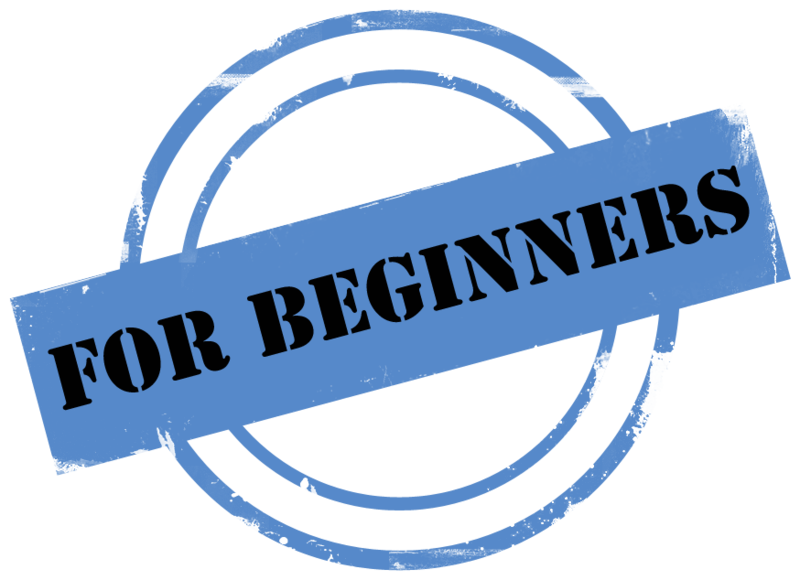 Training, accommodation in hotels or camp, camping equipment, meals, soft drinks and a selection of wine and beer, paramotor equipment rental, transport, transfers, instructors, staff, vehicles, park fees, petrol and oil for paramotors.